How about making an old regional classic new again? If you were not raised in the South, it is very unlikely that you have ever eaten, or even heard of, this classic Country Captain Chicken dish. Try this Southern classic chicken dish and enjoy! Country Captain Chicken is a curried chicken and rice dish with it’s origins from India and introduced to the East Coast United States first and then making it’s way to the South with great reception. Did you know that Country Captain Chicken is an Ready to Eat Meal in the Army. This is in honor of George S. Patton, who loves this meal. As with all chicken recipes in the South, Country Captain Chicken varies with the cook. Some recipes call for a long cooking time, whereas others use quick-cooking chicken breasts. One thing is always certain: it is perfumed and slightly spiced with curry. Your kitchen will smell divine from the welcoming aromas as this chicken is cooking. Chicken is one of the most popular meats to cook for dinner. Most cooks are looking for new ways to prepare chicken to keep things interesting for the family. I know my kids will groan when I tell them I am cooking chicken for dinner. In a shallow dish, combine flour, salt, and pepper. Roll chicken pieces in flour mixture to coat all sides. In a large nonstick frying pan over medium heat, heat vegetable oil. Add chicken pieces and cook 5 minutes per side or until light brown. NOTE: Chicken should not be cooked through at this point. Preheat oven to 200 degree F. Transfer chicken to an oven-proof dish and keep warm in the oven; reserving drippings in frying pan. Reduce heat for the frying pan to medium low. To the pan drippings, add onion, bell pepper, and garlic; cook 5 minutes, stirring occasionally, until onions are transparent. Add tomatoes, curry powder, salt, pepper, and thyme; cover pan and simmer gently an additional 15 minutes. Add the browned chicken and currants or raisins; cover and simmer another 20 minutes, stirring occasionally, until the chicken is tender or until a meat thermometer registers an internal temperature of 165 degrees F (juices will run clear when cut with the tip of a knife). This is the type of cooking and meat thermometer that I prefer and use in my cooking. I get many readers asking what cooking/meat thermometer that I prefer and use in my cooking and baking. I, personally, use the shown in the photo on the right. To learn more about this excellent thermometer and to also purchase one (if you desire), just click on the underlined: Thermapen Thermometer. Remove from heat and transfer chicken to a deep platter. 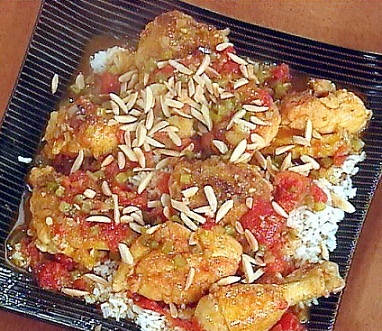 Spoon vegetables and sauce around the chicken and sprinkle with almonds. Serve with hot rice.